A Gosford Private Hospital Neurosurgeon has become the first surgeon in Australia to successfully implant artificial spacers into the spine. Dr Marc Coughlan specialises in minimally invasive spinal procedures, including using a new technique called, lateral access surgery, which involves going through a keyhole in the side of the body and placing an artificial, 3D printed, spacer or a generic spacer in the space between the vertebrae of the spine. The implants are tailored to cater for each individual patient’s unique anatomy and allow for the treatment of multiple conditions. “Using the lateral access technique to place the implants allows multiple levels of the spine to be accessed through the same keyhole, creating minimal disruption and thus very quick recoveries,” Dr Coughlan said. “We are fortunate at Gosford Private Hospital to also have a CT navigation system, BodyTom, which can be used throughout the surgery and allows visualisation in all three planes, ensuring that the implants are perfectly placed and positioned without the need to use X-ray. “The use of these procedures has massively reduced the recovery with complex spinal patients, and allows us to operate on more frail osteoporotic patients,” he added. 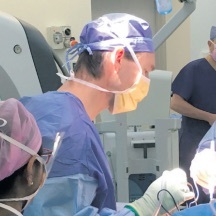 As part of a dedicated team of Neurosurgeons treating patients on the Central Coast over the past 13 years, Dr Coughlan has helped to introduce a number of procedures including minimally invasive lumbar decompression, spinal fusion techniques using lateral and anterior access, and disc replacement surgery to treat chronic lower back pain. “We’re proud to be leading the way in the provision of high end, innovative Neurosurgical procedures for patients here on the Central Coast. “Our team of specialist Neurosurgeons and experienced staff at Gosford Private are second-to-none, providing world class services locally and allowing patients to remain close to home and their family,” said Gosford Private Hospital CEO, Matt Kelly.